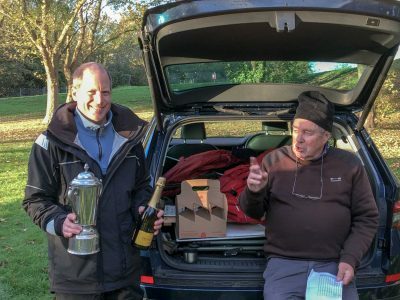 A breezy, sustained 13-16mph wind from the NE with gusts to 27mph , chilly 8 degrees and initially very damp day greeted the 15 skippers that had entered the 2018 Thames Cup event hosted by Coalhousefort RYC. By just after midday the dampness had all but gone and a little brightness to the sky appeared, later another shower, hail this time appeared but was thankfully short lived. With a course set and after the normal race briefing the first race commenced at 10am through until 12:30 when a short break was taken for lunch. The afternoon racing commencing again at 1pm and carried through until 3::45, a total of 17 races for the day. Colin Goodman dominated winning all but 2 of the races – both of which were discarded, ending the day with a very impressive score of 14 point. At times Colin was hotly challenged in races by Trevor Binks who finished the day on 33 points with Mark Dennis coming a very creditable third on 47 point.